With 72,000 square feet of space under one roof, DeSoto BMX is America’s first covered facility designed exclusively to host race events of all sizes. Conveniently located in southwest Dallas County, it has become well-known for hosting some of the largest BMX events. 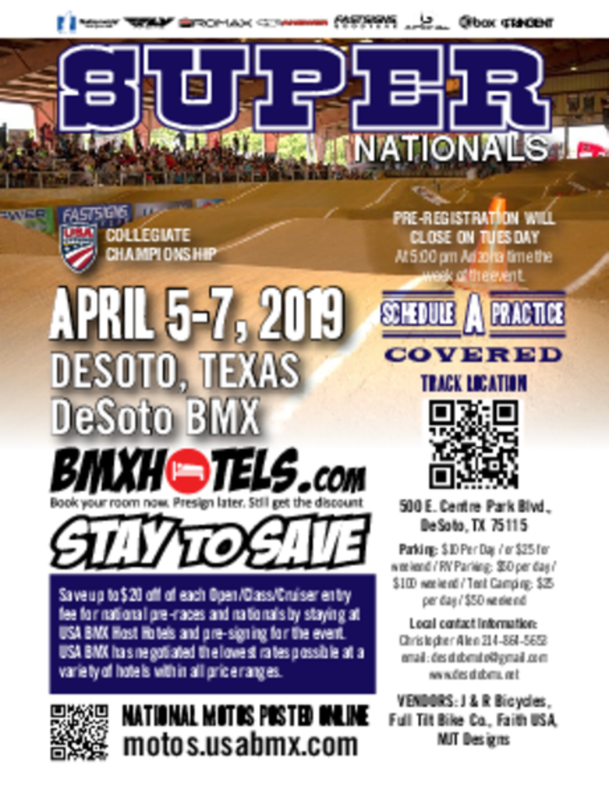 Since opening in 1999, DeSoto BMX has been the home of the annual USA BMX Super Nationals. The three-day event draws more than 1,800 participants every year. Riders include amateurs, professionals and Olympians from all over the world. The Super Nationals was held in May of 2018 and did not disappoint with over 3,000 spectators and riders from 6 different countries. The National brough 199 motos on Saturday alone! We look forward to the national each year. DeSoto BMX also hosts the annual Texas State Championship Finals. The two-day event, which draws more than 1,000 participants, offers amateurs an opportunity to race for the coveted Texas State Champion title. Riders hail from Texas and several other states—all racing for the large team and pro purses. In addition, DeSoto BMX annually hosts a Texas State Championship qualifier event, an annual Leukemia Society Race for Life, an annual Olympic Day race. In all, the facility hosts more than 90 district races each year. DeSoto BMX has hosted the USA Cycling National Championship and Gold Cup Finals three times. The USA Collegiate World Championships will return to Desoto in April 2019 and it will pair with the Super Nationals! In 2014, DeSoto BMX hosted the first Collegiate National BMX Racing Championship. This event featured college recruiters offering scholarships to some of the fastest amateurs and professional riders for college cycling teams. DeSoto BMX is open for racing practice every Monday and Wednesday night with racing clinics held on Tuesday and Thursday(see calendar for coaching events and clinics, these are not held each week), and races every Friday and Saturday nights. See the calendar for race details and contact information. DeSoto Residents practice for free with a current USA BMX membership. All DeSoto Residents must pay for racing. Every rider that comes to Desoto BMX for the first time will get a free- one day membership to try it out. The practice fee is waived too. Then, a rider must get a membership to ride and race after the first time. Just ask Casey Allen at the sign up both for more information. DeSoto BMX is located in the City of DeSoto in the southwest corner of Dallas County at the intersection of Interstate Highways 20 and 35E. Interstate Highways 30 and 45 are just a few miles away. A variety of hotels, motels and RV parks provide accommodations at all price ranges and there are endless dining choices in the area.